After finishing his studies of Electrical traction in the transport at the High Technical School of Transport in Pilsen in 1993 Ing. 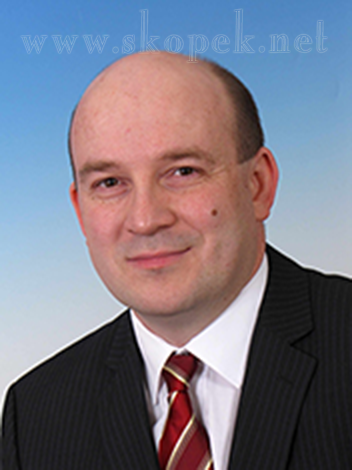 Škopek Martin, Ph.D. (* 1975) continued his studies in the field of power engineering with a focus on electric machines at the Faculty of Electrical Engineering of the University of West Bohemia, where he graduated in 1998. Then he joined the local Department of Theoretical Electrical Engineering as a doctoral student, where he, besides teaching activities, focused especially on computer simulation of electromagnetic and associated physical fields, in terms of both theoretical and practical (software implementation) viewpoints. In May 2002 he successfully defended his thesis “Methods of Mathematical and Computer Modelling of Selected Coupled Problems”. examination of inspections of air-conditioning systems. ECONOMICS, prices and estimates, specialization of energy, fuel, heating and hot water distribution incl. cost allocation. Within his expert activity he focuses mainly on the control of the supplied energy amount, the power balance, detection of unauthorized energy consumption and the subsequent determination of the overall costs caused to suppliers, assessment of the accuracy and legitimacy of the statement of the electricity, heat, hot water etc., evaluation of eligibility of applied damages related with energy devices, etc., ie mostly on applications related to the Energy Act (No. 458/2000 Coll., as amended) and the Energy Management Act (No. 406/2000 Coll., as amended). At the time, except own expert and auditing activities, he deals with the various technical tasks according to the needs of his customers, particularly in the context of the company Energy Consulting Service, s.r.o.® He is a distributor and consultant of QuickField program for the regions of the Czech Republic, Slovakia and Poland. The results of his scientific work of non-commercial character he continuously publishes in various publications, professional journals and at international conferences (author or coauthor of more than 65 conference papers, technical articles and other publications). He also belongs to a regular contributors in professional discussions on portals elektrika.cz, tzb-info.cz, Elektro bastlírna and others. Member of the Advisory Group for GILDED project. In the course of his business (since 1994 under the ID 60612738) he fully agrees with the initiative "We do business without corruption" and also, among other things, he regularly supports the international humanitarian organization Médecins Sans Frontières / Doctors Without Borders.